Running a marathon is so grueling that most people train relentlessly. While it’s wise to set your sights on running faster and farther, there are other important factors that one must consider in order to make it to race day without incurring a serious injury. According to Active.com, about 35% of first-time marathon runners are unable to compete in the races they were training for due to injury. This number shouldn’t be surprising, considering that the average 150-pound runner exerts 150 tons of force per mile — or 3,930 tons of force per foot over the course of a marathon. Here are a few tips for staying in tip-top shape (from head to toe) this season. “Runners preparing for a 26.2 mile race need to be well-rested,” said Dr. Aparajitha Verma, medical director of the Sleep Disorders Center at Houston Methodist Hospital. It’s recommended that runners avoid caffeine and alcohol the week before the race and set standard wakeup / bed times that provide seven or eight hours of shut-eye each night. – Heart: Marathons can be very intense on your cardiovascular system, so make sure you are cleared by a cardiologist before marathon training. Gradually increase your workload by no more than 10% each week. – Stomach: Beware of drinking too much water while running. A condition called hyponatremia can be just as dangerous as dehydration, as your serum sodium level decreases, causing your cells to swell. Before a run, eat foods high in sodium and choose sports drinks that replenish electrolytes instead. The rule of thumb is to drink one cup of fluid every 20 minutes during a race. 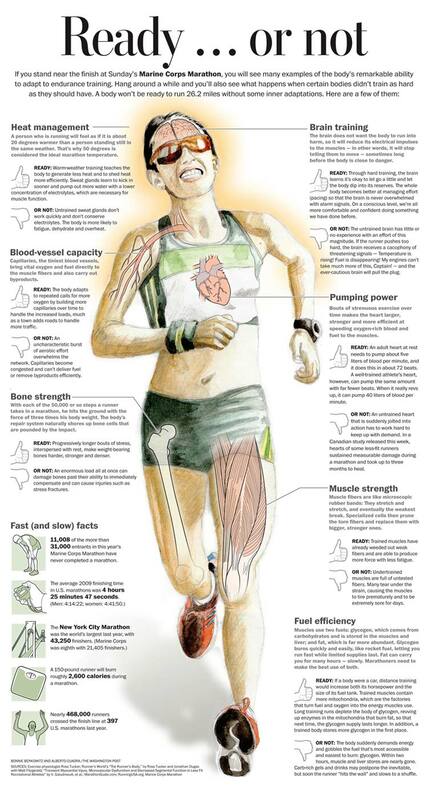 – Hips: Don’t just run to prepare for the race. Strength-training can eliminate hip pain by increasing the amount of force your core, glutes, and thigh muscles can endure — thus taking some of the stress off the hip. Flexibility exercises like yoga or Pilates are a great addition to a weekly regimen. – Knee: Take pressure off your knee by strengthening your glutes through side leg raises and stretching out your hamstrings using iliotibial bands after every run. You may also find it helpful to shorten your stride to reduce the likelihood of soft tissue injury. Gait analysis is one of our specialties at The Center for Podiatric Care and Sports Medicine in NYC. During this high-tech test, we have you run on treadmill connected to sensors to assess precisely how your feet are landing. We’ll be able to tell you if your foot is rolling inward or outward, if you’re a heel-striker or a forefoot-striker, how stable your ankle is, and if you’re likely to develop a particular injury based on your running pattern. We can also give you pointers to help you quicken your step. A trusted podiatrist may recommend using custom orthotics that are molded to fit your feet, which will diminish the amount of force exerted on your body. If you’re planning on participating in an upcoming marathon, make sure you visit a podiatrist to be sure that you’re properly prepared!